Here is the thing -- "brown" is not a derogatory term. It is not a word rooted in oppression, exclusion, bigotry, or hatred of any kind at the social or institutional level. The term is value neutral. It holds no malice, or intent to harm. It is not a powerful reminder of disenfranchisement and racial divisions such as the term"n*****." As wonderful as it is that people want to step up to the plate to help create inclusion and openness, I just wish it was with some context. Instead, get up off your feet when you hear some of the following slurs that are offensive and have been historically directed towards brown people. 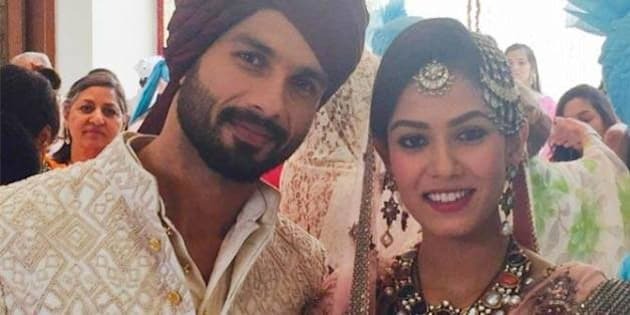 A recent article by Arti Patel, titled, "Shahid Kapoor's New Wife Mira Rajput's Outfits Have Every Brown Girl Drooling" brought out the most impassioned responses regarding racism, diversity, inclusion and acceptance. Too bad it was without context. Here is the thing -- "brown" is not a derogatory term. It is not a word rooted in oppression, exclusion, bigotry, or hatred of any kind at the social or institutional level. The term is value neutral. It holds no malice, or intent to harm. It is not a powerful reminder of disenfranchisement and racial divisions such as the term"n*****." So, why act like it is? "Why should only brown girls drool? Why can't we all be in awe of incredible fashion despite our skin colour? Do better Huffington Post, do better"
"Brown girl?? Really! That's offensive." "'Brown girls ... Really? 'White' girls are exempt? Blatant racism, no?" As wonderful as it is that people want to step up to the plate to help create inclusion and openness, I just wish it was with some context. Get up off your feet when you hear some of the following slurs that are offensive and have been historically directed towards brown people: rag head, terrorist, or dot head. Stand up when you see people on social media accounts telling your fellow Canadians to "go back to your country" simply because their name is not Joe Smith. Speak out when people simply assume we are "immigrants" -- not that there is anything wrong with being an immigrant -- because of the colour of our skin. Get angry when you hear someone ask: "When are they going to apologize for this terrorist attack?" They should realize that a collective is not responsible for the wrongs of an individual. So, no, every brown-skinned person is not a terrorist or out to bomb your country -- hell it is our country too people -- so stop acting like we are. Confronting hatred, malice, ignorance and the likes of it in person or on social media is good -- it facilitates discussion and can potentially open up minds. However, let us look at the context of the discussion before we jump up with our torches and pitchforks. There is a great difference between saying "I love the way brown girls dress" and saying "all brown people are terrorists." Note: The word brown is not what qualifies the latter sentence as racist, inflammatory or filled with hate -- it is the content within it. Some might argue that it is unfair to lump in such a culturally and religiously diverse group as one homogenous entity -- brown. Sure, if you choose to be hypersensitive about it. I personally cannot differentiate between a white person who is German, French, Dutch, Russian, English and so forth at a glance. Sometimes the last name can give it away, but even that isn't 100 per cent accurate. So then, why I should I expect a person to know if I am a Hindu, Sikh, Muslim, Christian, atheist and so forth? Why should I expect a person to inherently know if I am Punjabi, Rajasthani, Haryani, Mahrashtrian, Indian, Pakistani, Bangladeshi and so forth? However, every time I am told that I need to "go back" to my country or stop worshiping Allah and embrace Jesus Christ, I will stand up. I will speak up because I can see that there is plenty of learning to be done by these people. They have a lot to learn and I have a lot to teach. As for the fashionistas that took offense to being inadvertently left behind, all that can be said to that is: consider the fact that "brown girls" -- Indian, Pakistani, Sikh, Hindu or Muslim alike -- are the ones that grow up dreaming about wearing a lengha or donning a saree with dark mendhi and all the pre-wedding fanfare and ceremonies for their big day. Hence why they would most likely be the ones drooling -- not that no one else can or will drool over someone's style or look. That and they've probably seen all of Shahid's movies and are having some husband envy right now. How Racist is Your Flag on a Scale of 1 to Confederate?